Live music workshop to help heal the body, mind and soul! Enjoy healing meditations and powerful release of stress for self-healing. Dr. Oliver uses live sounds with ancient musical traditions, to open, balance and harmonize the energy centers in your body, mind and spirit. 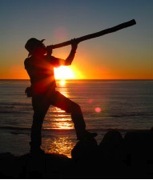 The sounds of the Native American flute, didgeridoo, frame drum and overtone vocalization are some of his tools for opening the door. The music workshop helps individuals and groups create wellness in a stressed out world by helping them to access their creative side. The incorporation of sound and rhythm is an integral part of Dr. Oliver's holistic lifestyle processes. "After my accident, when I was recovering from skin graft surgery on my back, a friend of mine who’s a chiropractor, holistic practitioner, and Native American flute player offered to do a sound healing, a 'tonal attunement' as he called it. I had no idea what that meant, but I went to his office and followed him and his partner into a small room. There was a futon on the floor in the center of the room, images of wildlife on the walls, and candlelight flickering in the shadows. My only task was to lie down, close my eyes, and relax." "For the next hour, I visited nirvana as they shrouded me in sound, beginning with the deep drone of the Australian aboriginal didgeridoo. During the session, they also used Native American flutes, gongs, Tibetan bowls and prayer chimes, drums, and rattles. At one point both of them placed their didgeridoos on my belly and droned away, creating overtones to shift my frequency and open whatever channels were blocked by the trauma. They used the rattles, they said later, to ruffle up my energy field and get me back to my original resonance with the earth. When I left their office, I knew something had shifted, but I didn’t know until later that it was my own frequencies that had changed, as they rebalanced with the heavens, reconnected with the Source."